The dental community has long held the belief that a patient should be taken off anti-coagulants for virtually every dental procedure, no matter how small, because of the risk of bleeding. For years now we have known this is not true and can cause death, primarily from a stroke. These are very serious dental malpractice cases that result in serious injury and death. What are Anticoagulants and Antiplatelets? Anticoagulants are drugs that interfere with your blood’s natural ability to clot in response to an injury. Clotting is important to prevent bleeding from a cut or wound. Typically, when you sustain a cut, your body goes through a three-part clotting process. First, proteins cause the damaged blood vessel to undergo a vasospasm, reducing the size of the damaged area and cutting off the flow of blood. Second, the damaged blood vessel releases proteins, or Von Willebrand factors, which causes the platelets in the blood to become sticky, forming a plug in the area of the damaged vessel wall. An example of an anticoagulant discontinuation lawsuit in the surgical context that led to a wrongful death lawsuit. These cases frequently arise before and after a surgical procedure. 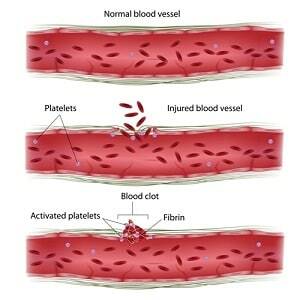 Third, the body undergoes a complicated process called the clotting cascade. This cascade is a sequence of numerous clotting factors that interact to form a fibrin mesh at the site of the injury. Acting as a sticky net, the fibrin mesh traps passing red blood cells further plugging the damaged wall. Anticoagulants are medications that interfere with the body’s ability to perform the third part of this process, going through the clotting cascade and creating the fibrin mesh. Antiplatelets interfere with the second part of this process. It is worth noting that your body will still continue to use platelets to plug a damaged vessel, even if anticoagulants interfere with the clotting cascade. The mainstay in the anticoagulant class for many years has been the vitamin K antagonist warfarin (Coumadin). Common antiplatelet medications are aspirin (Aggrenox) and Plavix (Clopidogrel). Warfarin acts by inhibiting the synthesis of the vitamin K-dependent clotting factors II, VII, XI, and X. Warfarin is commonly prescribed to patients at high risk of stroke from other medical conditions. Other conditions that often lead to blood thinners are deep vein thrombosis, atrial fibrillation, prior myocardial infarction, coronary artery disease, peripheral vascular disease, and prior heart surgery, among many others. In October 2010, the Food and Drug Administration approved the first oral direct thrombin inhibitor, Pradaxa, a medication with problems of its own. This medication inhibits thrombin from converting fibrinogen into fibrin in the coagulation cascade, thereby preventing the formation of a clot. There is less available information on these medications and the risk of bleeding versus stroke if the therapy is interrupted for dental procedures. Going back to Vitamin K-antagonists, these are often closely monitored with a standardized system of measurement called the International Normalized Ratio (INR). For most patients, the target INR range is 2.0 to 3.0. However, this range varies with the nature of the patient’s condition and the risk of clots. The therapeutic range usually increases the risk of clot formation. For example, in a patient with a heart valve replacement, the standard therapeutic range is usually an INR of 2.5 to 3.5. Importantly, immediate cessation or subtherapeutic levels of the drug can increase the risk of stroke dramatically. As a result, it is critical that any healthcare provider, including dentists, weigh the risk of bleeding versus the risk of stroke in deciding to stop a patient’s medication. For many years, doctors thought the risk of bleeding for a patient on anticoagulants or antiplatelets and undergoing a dental procedure far exceeded the risk of stroke. Therefore, the anticoagulants or antiplatelets should be stopped several days before the procedure. However, numerous studies have shown the exact opposite, that it is, in fact, safer to keep a patient on their medications for most dental procedures ranging from routine cleanings to multiple extractions. Although there is always a risk of bleeding in these patients, the risk is relatively minimal compared to the severe consequence of a fatal or debilitating stroke. When bleeding does occur, it is usually easily controlled with local measures and does not require hospitalization. In fact, a review of recent literature could not find a single instance where a patient died or suffered a disabling injury as a result of bleeding because they were kept on their anticoagulants or antiplatelets for a dental procedure. This evidence overwhelmingly suggests that the standard of care for most dental procedures is to keep a patient on their anticoagulants or antiplatelets. Removing these patients creates an unnecessary risk of stroke. Every dentist confronted with a patient on anticoagulants should be sure to take a thorough history including whether the patient is on anticoagulants or antiplatelets, how long the patient has been on their medication, their therapeutic range, and how often their INR is checked. The dentist should further speak with the patient’s physician to determine why the patient is on these medications and whether it is safe to take the patient off for a procedure. When is this Dental Malpractice? All too often the source of the dental malpractice in these cases is poor communication between the dentist and the patient’s physician. The dentist says something to the patient about stopping their Coumadin. The dentist doesn’t call the doctor. The patient doesn’t call the doctor. The procedure is performed, and two days later the patient dies of a stroke. These kinds of problems can be easily prevented with a simple phone call. It is the standard of care for the dentist to find out whether the patient is taking an anticoagulant and to reach out to the physician to explain the risk of bleeding. The physician likewise has an obligation to explain the risk of stroke to the patient and the dentist, if the patient is removed from their medication. A decision then has to be made on how to proceed. Because the dentist is not a physician, it is malpractice for a dentist to tell the patient to stop taking an anticoagulant or antiplatelet. Similarly, it is medical malpractice if the dentist fails to consult with the patient’s physician regarding the proposed procedure and risk of bleeding. It may also be malpractice if the physician inappropriately tells a patient to stop their medication for a relatively minor dental procedure with a minimal risk of bleeding. There are not many recent verdicts out there. Why? The standard of care is so convincing that nearly all of these cases have settled before trial. This also reflects the current change in thinking over the last 15 years. It used to be that a dentist would be sued for dental malpractice if a patient suffered bleeding because they were kept on their anticoagulant for a dental procedure. The defense would argue keeping a patient on these medications wasn’t a violation of the standard of care given the risk of stroke if the medications were stopped. In nearly every case, the defense won on this theory, which should say something about whether a doctor should take a patient off anticoagulants or antiplatelets for a routine dental procedure. Make no mistake about it – in most cases, the standard of care is to keep the patient on these medications for most dental procedures. If you or a loved one has been severely hurt or killed, you want answers, and you want to be compensated for the harm that was done. Call us at 410-779-4600 or get a free online consultation.